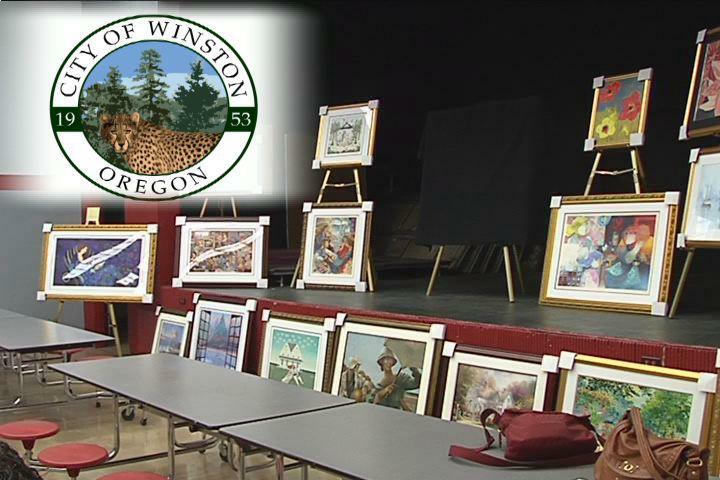 WINSTON, Ore. (MSNBC.com)–Thousands of dollars worth of free paintings are being donated to Douglas High School in Winston and the city is getting a new logo all from efforts by a Michigan based art gallery. Park West Gallery of Southfield, Michigan unveiled the paintings Monday, November 15, 2010, at Douglas High. Twenty paintings in all, valued at around 20 to 30-thousand dollars are being donated to the high school’s art department. Many of the paintings are original and professionally framed. The gallery also donated several art books to the school. Students will get permanent access to the paintings and books to study them as part of their art classes at the high school. The donation ended up at Douglas High School thanks to the mayor of Winston Rex Stevens and his wife Gail Stevens. Both collect art and wanted to find a way give back to the Douglas High Art Department. The Stevens say the department made a profound, positive impact on their daughter. Eventually, the Stevens found Park West Gallery in Michigan. It made the donation to the high school and city after hearing stories of the city’s economic trouble. Douglas High’s Art Department instructor Deborah Cusack says the donation will have a profound impact on students, allowing them to study a mini-gallery with various art styles, all without having to travel. “This is an art teacher’s dream, usually we have to get the money to put them all on a school bus and get chaperones and haul them to Portland or Ashland… And here it was brought right to our city of Winston and it’s just a wonder, wonderful event,” says Cusack. Along with the art presentation Monday, November 15, 2010, renowned artist Dominic Pangborn spent the day with students, answering questions about their artwork. As part of Park West’s donation to the school, Pangborn (an artist represented by Park West Gallery) gave an exclusive painting of a tiger to the city of Winston, which will hang in Winston City Hall. Pangborn also redesigned the city of Winston ’s logo for free. “It’s a small city and you have a vital arts program,” says Pangborn. A junior at Douglas High, Marcy Deleon says the school’s art program has already had a big impact on her and her school. “I didn’t know blending or shading or oil painting which is now my favorite type of art to do,” says Deleon. “Learning with Ms. Cusack, I was opened to a whole bunch of stuff. If we didn’t have the art program at the high school, I think kids would be doing a lot worse stuff,” says Deleon. Deleon says she has future passions of pursuing art. She says the donation to the school’s art program will help her education and others. “It’ll get kids interested and be like oh whoa, that’s cool and I should do something like that and go learn about art too,” says Deleon. The donated paintings will soon go up around Douglas High School. The city of Winston has already approved the new logo in city council and plans on officially using it in the coming months. If your organization is interested in receiving a Park West Gallery CARES donation, please contact marketing@parkwestgallery.com. The Art students and teacher at Douglas High School, and many citizens of Winston, Or, appreciate the generous donation from Park West Gallery CARES program. The students will be able to study art forms right in their classrooms. Dominic connected with so many of the students. As he left the school, a Senior caught Dominic in the hall, pulled out a drawing, wanting Dominic’sopinion about it. Dominic pulled out his pad illustrating a point, deep in conversation about art with this student. A memorable day for so many. My husband, Mayor Rex Stevens, and myself have been so overwhelmed with the generousity and kindness the Park West Gallery family has shown to us and our small community. Dominic is a treasure. Again, thank you ever so much for the gifts.